"Goddard F S" is commemorated on the 1914-1919 WW1 Memorial, which originally stood in the churchyard of St Lawrence's Church. There were two potential F S Goddards with links to Brentford, Ken Goddard's research has identified which man is remembered on the memorial. Ken Goddard, who has developed a website dedicated to the Goddard family. My Dad Stanley Goddard remembers a family photo (long since lost) of a soldier sitting in a chair wearing his army uniform; he also distinctly remembers that the soldier had stripes on his uniform sleeve. My dad asked his parents who was the soldier in the photo; they said he was Stanley Goddard a cousin, who lived with his grandmother before the First World War and just after being promoted was sent to the front line and killed days later. In remembrance my dad was named after him. My dad had always thought Stanley was a cousin of his father; but having already done extensive research on my Grandfathers ancestors I knew he did not have a cousin called Stanley. I decided to further research my Grandfathers siblings and uncovered a likely candidate, who would have been my dad’s cousin. Frederick Stanley was born in Old Brentford on the 26th March 1893 to parents William Henry James Goddard and Evangeline Nora Louise GROVES, William Goddard was my Grandfathers brother. In the 1901 census Frederick Stanley was living in Glenhurst Road Old Brentford with his grandparents William Groves and (Evangeline) Martha Groves, being referred to as Stanley and not Frederick. In the 1911 census the only Frederick that could be found who came remotely close to being the same person, was Frederick Goddard stationed in Farham Surrey, aged 20 born Bedfont Middlesex, a private in the 4th Royal Fusiliers regiment. I decided to ignore his age and place of birth as being misinterpreted in the census and pursue in finding out more about this Frederick Goddard’s army career, in the hope it would lead me back to Brentford. I searched for Frederick Goddard’s army records, but sadly there are none to be found as of this moment, maybe they had been destroyed in the Second World War. I then checked the medal indexes and came across an F S Goddard; I never thought in my wildest dreams that a medal index card would hold all the answers, but it did. F S Goddard was a 2nd Lieutenant in the 4th Royal Fusiliers, killed in action on the 15th December 1917; he had just received a commission from Sergeant to 2nd Lieutenant on the 2nd December 1917. Under his initials F S was written Frederick Stanley, this had been added at a later date and became apparent with the notes on the correspondence page of his index. His medals had been applied for in 1921 by Mrs E M Groves who must have been his Grandmother whom he had been living with as it could not be his Mother, she had died in 1914. The story my Dad had been told fitted nicely with the details recorded on Frederick Stanley’s medal index card, but how did he jump from being a sergeant to a commissioned officer? The Royal Fusiliers (London Regiment) was also a feeder for other regiments, on the 1st November 1915, F S Goddard was assigned to the Bedford Regular Battalion as a temporary 2nd Lieutenant Officer. I cannot prove he was the same person, although I have not found any records of a F Goddard in the Bedfordshire regiment. He entered the theatre of war in France on the 17th February 1915, between then and 1917 I’m not sure what role Frederick Stanley played, but in the December of 1917 he was in the trenches opposite Pronville France with the Royal Fusiliers as Company Quartermaster Sergeant. On the 6th December he was promoted; extract taken from war diaries reads “CQMS. Goddard F. promoted to the rank of 2nd Lieutenant and posted to the 4th Royal Fusiliers”. The battalion was relieved on the 7th and marched to Mory arriving on the 10th via Vaulx. They were back in the trenches on the 12th and two days later they received an SOS to move forward, they successfully advanced 150 yards north in Pudsey Support, on the 15th December 1917 Frederick Stanley Goddard was killed in action. Extract taken from war diaries reads “on 15th – 2nd Lieutenant GODDARD killed while holding front line block on right – our own Artillery was continually shooting short into this block – 3 other ranks killed, 10 died of wounds, 5 other ranks wounded”. I sense from those words it was felt that these poor souls may have been killed by friendly fire. Who was Frederick Sidney Goddard? I still had a nagging doubt about the true identity of the F S Goddard on the Brentford War Memorial and the possibility of it being Frederick Sidney Goddard whose birth was registered in Brentford in October - December 1886. Also both Ancestry and findmypast websites have an entry for Frederick Sidney Goddard 2nd Lieutenant 4th Royal Fusiliers, killed in action 15th December 1917. 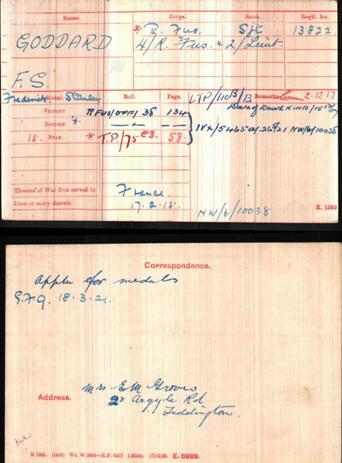 What are the chances of two Frederick Goddard’s from the same regiment of the same rank and being killed on the same date, the war diaries do not support it. I checked the 1891 and 1901 census for a Frederick Goddard born in Brentford in 1886, but found none. I did find a Frederick Goddard born in Chiswick of the right age and if you were born in Chiswick at that time you would have your birth registered in Brentford. He wasn’t to be found in the 1911 census, so I checked out the army and medal index with no luck. I then checked the naval records and came across Frederick Sidney Goddard born Chiswick. He enrolled on the 15th August 1902 as a boy 2nd class; he gave his birth date as the 2nd October which fits with being registered in the December birth index, but recorded his year of birth as 1885. He probably lied so it would fast track him to an ordinary seaman which automatically happened on your 18th birthday. On the 2nd October in 1903 he signed up for 12 years, but only completed just over two years, he seems to have liked spending his naval career in the cells, visiting on at least four different occasions, he was discharged on the 5th July 1905 after completing his final stint, he still had to serve 42 days to make up for lost time, his discharge was finally approved on the 4th January 1906 with the words “Service no longer required, he being an insubordinate and objectionable man and most unsatisfactory in his work”, he left the navy on the 7th January 1906 whilst ashore. Frederick Sidney Goddard doesn’t seem to be of a character that would have made him a 2nd Lieutenant in the Army.